Flood waters from hurricane Florence inundate the town of Engelhard, N.C., Saturday. 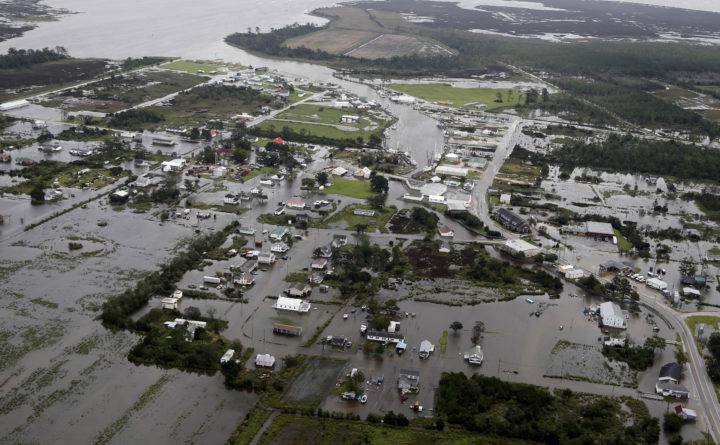 NEW BERN, North Carolina — The Marines, the Coast Guard, civilian crews and volunteers used helicopters, boats and heavy-duty vehicles Saturday to rescue hundreds of people trapped by Florence’s shoreline onslaught, even as North Carolina braced for what could be the next stage of the disaster: widespread, catastrophic flooding inland. A day after blowing ashore with 90 mph winds, Florence practically parked itself over land all day long and poured on the rain. With rivers rising toward record levels, thousands of people were ordered to evacuate for fear the next few days could bring the most destructive round of flooding in North Carolina history. As of 5 p.m., Florence was centered about 60 miles west of Myrtle Beach, South Carolina, inching west at 2 mph — not even as fast as a person walking. Its winds were down to 45 mph. With half of the storm still out over the Atlantic, Florence continued to collect warm ocean water and dump it on land. The flash flooding could devastate communities and endanger dams, roads and bridges. Authorities ordered the immediate evacuation of up to 7,500 people living within a mile of a stretch of the Cape Fear River and the Little River, about 100 miles from the coast. The evacuation zone included part of the city of Fayetteville, population 200,000. One potential road out was blocked as flooding forced the shutdown of a 16-mile stretch of Interstate 95, the main highway along the Eastern Seaboard.